Epiphany Party! Join us at the Wright's house to celebrate Epiphany January 7th at 4pm. We hope to see you there! WOW Service will start back Wednesday, Jan 10th with a meal at 5:30 pm: Shrimp Bisque, bread, salad, and dessert. Cost is $4/adult, $2/child, with a maximum cost of $12/family. Please join us! Jan 14th, at 2:00 pm. in the Upper Room. There is no Wednesday evening activities until January 10th. The office will be closed Wednesday, Dec 20th-27th for the Christmas Holiday. Contribution envelopes are available now for the 2018 year. They are in the hall behind the sanctuary. Feel free to grab yours today! at (662)-289-9965 or Ben Cayson at 662-436- 0101.
foster care in MS and 31 of those in Attala County? The need is simple! Attala County has one car seat that Social Workers can transport children. pm in the Fellowship Hall. The Church Wide Thanksgiving meal will be at 5:30 on Wednesday, Nov. 15.
homebound members also. Price increase for this meal, $5. Adults, $3. “angel” you can be pick up the tag on Nov. 19. Stitch in Time Ministry are making hats for Allie’s Joys Christmas. stockings. Stockings. Pam Comfort for more info at 289-5575. Wednesday Evening Meal Menu: Cheesy Chicken and Brocolli with Rice, Green Salad, Rice and Dessert (Kay Dawson's Team). Meal starts at 5:30pm and the cost is $4 per adult, $2 per child, max of $12 per family. Please join us! Tuesday Sept 26th we're hosting Charge Conference! We will have worship and refreshments. Please join us at 6:30pm. Wednesday the Lunch Bunch is taking a trip to the Governor's Mansion, followed by lunch. Please contact the church office for more information and to sign up. We won't have Wednesday evening meal/fellowship the weeks of Oct 4 and 11th. 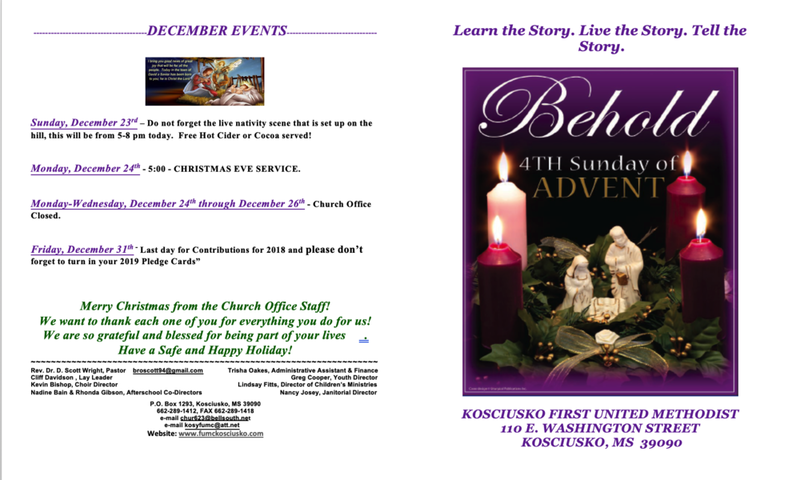 We will then start back with our Advent study, "All I Want for Christmas". Our children will also be doing a similar study. Wednesday evening will be a Youth Fundraiser for Evening Fellowship. Dinner will be donation based. Menu: Chili Cheese Dogs, chips & dip, and dessert. Please come support our youth! 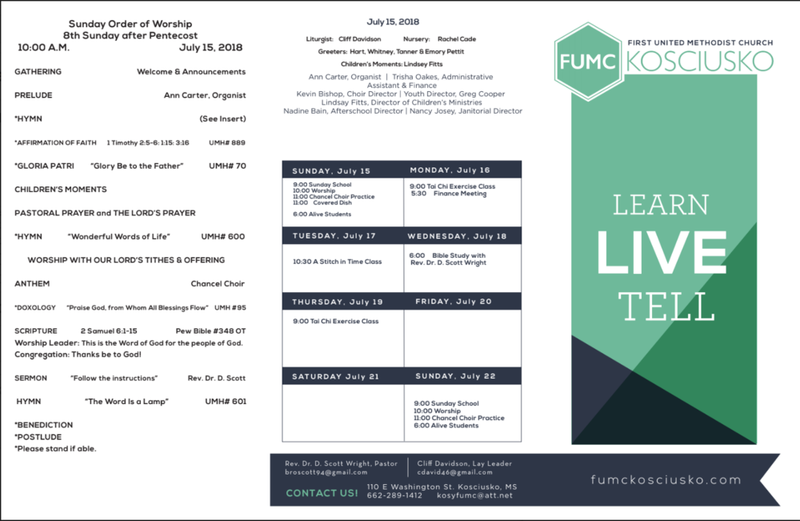 Sunday evening we'll be having our "Camp Meeting Worship" at 6pm with a Fish Fry! Come and join us! Please join us Thursday Aug 31st for the Helping Hands Talent Show! This is a great fundraiser for this local mission. Dinner will be served starting at 6pm. Please contact the church office to get your tickets! Wed. Aug 30th there's a Good Shepherd Meeting in the parlor at 10am. This mission reaches out to church members seeking to ensure they are doing ok and inquiring about needs. 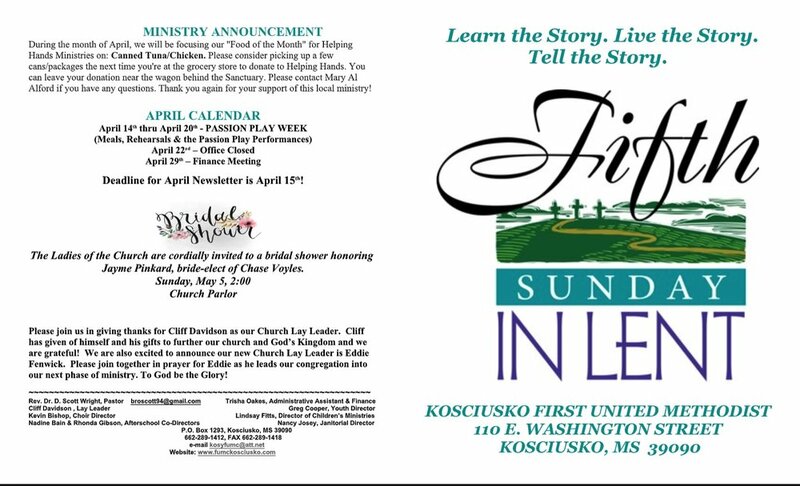 If you'd be interested in participating in this mission, please contact Carolyn Ritter or the church office. BACK TO SCHOOL! Friday August 4th is the first day of school! If you'd be willing/available to assist with after school care needs the first week, please contact Mary Al Alford. There's no Wednesday evening activities this week, but they'll be starting back very soon! August 9th will start back with a meal at 5:30pm followed by children, youth and adult activities at 6pm. We hope to see you very soon! fellowship. Make plans to attend. No WOW/Wednesday night services during the summer. There is a group that meets for prayer meeting on Wednesday's in the parlor at 5:30. Everyone is welcome to attend. There will be a bridal shower for Jenna Pinkard in the parlor today at 2pm. All are invited to attend. Tuesday and Thursday at 9am there is a free Tai Chi class held in the Fellowship Hall. Please bring a mat and towel with you. All are welcome. This is a low impact class. Beginners are welcomed to attend. Finance meeting will be Monday at 5:30pm in the parlor. No Women's Bible study this Thursday. Big thanks to Lynn Wiggers for hosting the children's swim party! Everyone had a blast! This November for Holiday Happening, there will be a different type of silent Auction. It will be a Potpourri of Talents, which means that members of our congregation will share their talents with others. If you are good wood working, baking, sewing, babysitting, photography, etc, please start thinking how you can participate, for the possibilities are endless. We are holding prayer meeting in the Parlor on Wednesday evenings throughout the summer. Please join us for a time of fellowship and devotion and prayer at 5:30. Our special musical guests this week are Helen Redding and Antonio Hunt. Helen joins us from First Presbyterian Church of Jackson, TN where she serves as the choir director. Helen is the sister of Tim Alford. Antonio currently serves on the faculty at University of Oklahoma School of Music. He is also the Chapel Choir Director at McFarlin Memorial Methodist Church in Norman, OK. Welcome! The flowers on the alter are in loving memory of Virginia Small Alford. We aren't having Wednesday evening WOW services this summer; however, we are having a prayer meeting at 5:30 on Wednesday in the parlor. Please join us! There is a small meal offered, fellowship and devotion. There's a bridal shower for Jenna Pinkard planned for Sunday July 16th at 2pm in the church parlor. All ladies are invited to attend.